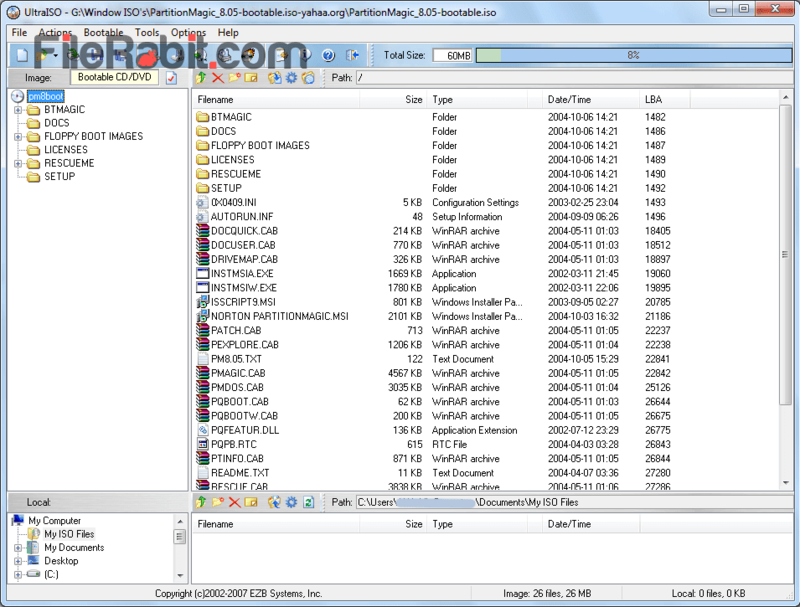 UltraISO is useful utility to create, edit, convert and save ISO files. It can make bootable CD/DVD, extract and also burn CD/DVD/ISO image files with TAO and DAO features. It support almost every type of image files e.g. ISO, BIN, IMG, CIF, NRG and others. ISO and BIN are most popular bootable image files among all of them. UltraISO support both with creating, editing, extracting, finalizing and burning functionalities. Burn CD or DVD image files directly into CD/DVD disc with the support of both Track at Once (TAO) and Disc at Once (DAO) methods. It will choose maximum burning/writing speed automatically. Anyway, creating a custom bootable ISO disc image is difficult job but UltraISO gives simple, easy and fast ways to done this job. Changing a folder into ISO/BIN/IMG image files and extracting a bootable image file into folders is extremely easy now. This is one of light weight and less resource taking software that gives powerful enhanced user friendly interface. Adding files individually or insert large folders with drag and drop support. The attributes can be set to hidden directly to save more time. However, creating audio disc image and burn that image file directly into CD/DVD disc. The installation will add integration into Windows Shell for immediate actions. The main functions are add to ISO file, Compress to and Burn to disc… as well. The gaming users can use it for creating virtual disc drives for mounting purposes. The latest version can create up to 8 virtual disc drives into My Computer.